Be sure to scroll through and pay attention the the amazing list of books, bonuses and more bonuses and all the way at the end is the entry form for the ipad mini, apron and amazon gift card giveaway! 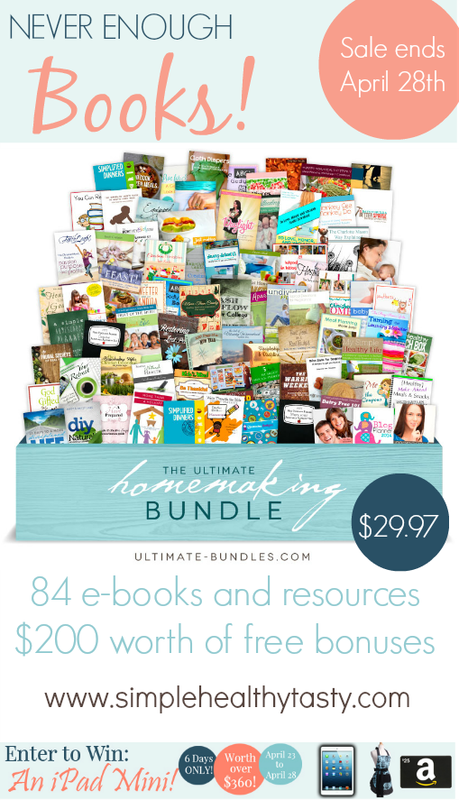 By popular demand, 100+ homemaking bloggers are bringing back The Ultimate Homemaking Bundle and it's better than ever! Unlike a library, though, you don’t have to spend years building it up. We’ve done the hard work for you, searching the web to find the very best eBooks from top homemaking authors and combining them into one essential collection that you can buy in one simple purchase. SORRY this sale is over if you would like to be notified of sales similar to it in the future sign up for my newsletter by clicking here. We’re confident you won’t find a more comprehensive set of homemaking resources anywhere -- and certainly not at this price. Bought separately, they’d cost a total of $698 (not including $200+ in bonuses!). But you can have all of them for just $29.95, or $39.95 for bonus Kindle editions! We believe it’s the best deal on homemaking eBooks anywhere on the web. But it will only be available for six days. So grab yours before it's gone! How much? Well now, that's the best part. The entire package is worth nearly $900, and we're selling it for less than $30. Sweet deal, right? 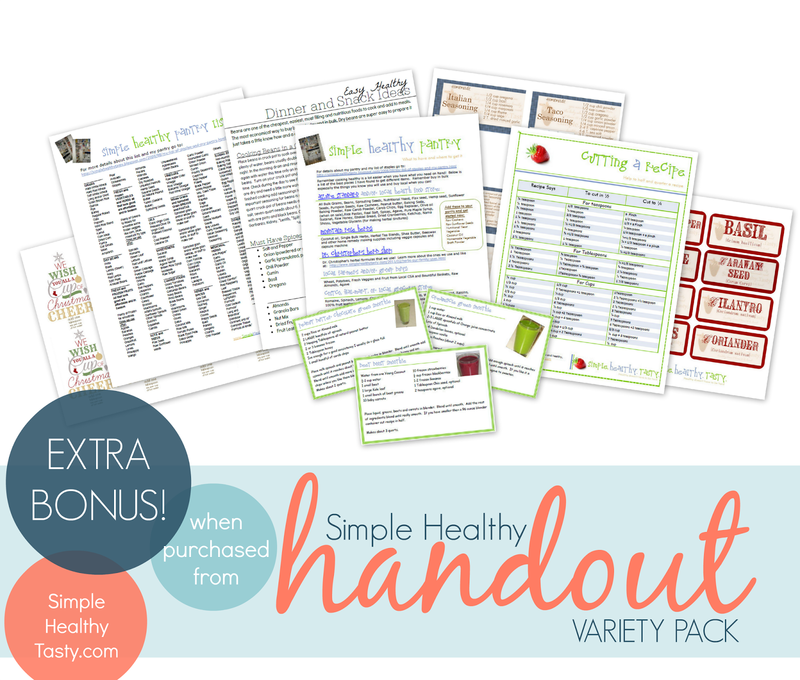 In addition to all the amazing eResources, this bundle includes the best bonus offers we've ever had. DaySpring—A FREE 10-pack of Premium Greeting Cards. HopeInk—$15 HopeInk store credit to be used towards anything + a FREE 8×10 Art Print with order. Redeeming Beauty Mineral Makeup—3 FREE eyeshadows of your choice from Redeeming Beauty. Marie-Madeline Studio—A $15 store credit for anything in Marie-Madeline Studio's online store. Once a Month Meals—A FREE One Month Pro Membership from Once a Month Meals. Dizolve—FREE 64-load pack of Dizolve Laundry Strips for you PLUS a Free 64-load pack of Dizolve Laundry Strips for food banks. TrilLight Health—FREE $15 store credit to be used toward Trilight Health's liquid health formulas. List Planit—Free 3-month membership to ListPlanit.com ListPlanIt. Bulk Herb Store—Instant download of the instructional video Making Herbs Simple Volume 2 for FREE from Bulk Herb Store. Fit2B™ Studio—FREE 2-Month Online Fitness Membership at Fit2B™ Studio. Remember, this bundle is available for 6 days only, from 8 a.m. (EST) on Wednesday, April 23 to 11:59pm (EST) on Monday, April 28th. Disclosure: I have included affiliate links in this post. Click here to read the fine print about this bundle. Click here to read the answers to frequently asked questions. REMEMBER my added bonus too! Please don't forget to email after you purchase so I can send you my own personal thank you! Click here to learn more. I have been wanting to experiment with freezer meals for a while now, maybe this book: The ABC’s of Freezer Cooking (by K.M. @ KMLogan.com) Will help me get started! Real Food on a Real Budget: How to Eat Healthy for Less is the book that appeals to me the most because I am all about eating healthy and nutritious but also not breaking the bank to do so. The working from home and blogging books, those on stewardship and everything related to faith appeal to me!! Thanks for sharing all these great titles and woohoo to you for an awesome giveaway!! 'It's Me or the Coupons: How a Busy Mom Can Win the Grocery Budget Battle' because I am interested in coupons and saving money on my grocery bill without dedicating too much time to doing so since I am always so busy. Healing with God's earthly gifts looks great! I think we mothers can heal alongside our husbands! I love listening to others tried and true ways! The blogger books and the toddler homeschool books. I would like to start a blog but unsure how to and i need new ideas to keep my bery busy 3 year old busy! If I can get the tips and tricks out of any one of these books to help myself help my family today! wow! Is all I can say. That would be AMAZING! To say the least very helpful I am sure! I'd love to read your book and I'm also interested in the dairy-free book to see if she has any ideas I haven't heard about. Hi Tammie! I'd love to read your book or any of the ones in the organizing section. I want to learn about cleaning in a healthy way, and being more organized around here is always a good thing!